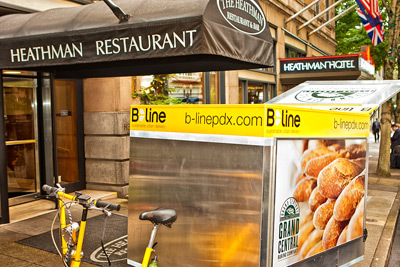 In recent months Grand Central Bakery decided to partner with B-line to deliver their late bake afternoon route. This is their third bread bake of the day, which means the restaurants and their customers get the freshest artisan bread possible. Another plus is it takes one of their delivers vans off the road. So not only is the rustic bread uber-fresh but it's delivered with out using a drop of gasoline. Okay I have a confession…I love doing this route. For the most part it stays consistent throughout the week in terms of the load. Since I'm pedaling hard for GCB, they are kind enough to give me some free perks like coffee, bread and pastries. I'll often wait to have my morning coffee until the beginning of my route, at 1:30pm! Since time is of the essence I tend to drink a small 8 oz. cup in a matter of minutes. I'm sure my first few stops are amazed at how alert and full of energy their bread delivery person is everyday. There are eleven stops on this route and each stop is unique in it's own way, which makes for an interesting work day filled with conversations about both B-line and Grand Central Bakery. After loading up at the bakery at NW York, I pedal toward 21st and Kearney toward Caffe Mingo and Bar Mingo. This area can be tricky for parking the trike because at times people will, I can can only assume, miss the loading zone sign in front of the two restaurants making me pull up on the narrow sidewalk to park - possible but not ideal. This being my first stop has the most powerful smell of fresh baked bread. So as I open the back door of the trike it never fails that people in the near vicinity will get a whiff and turn their heads. At times they even want to purchase a loaf straight from the trike. 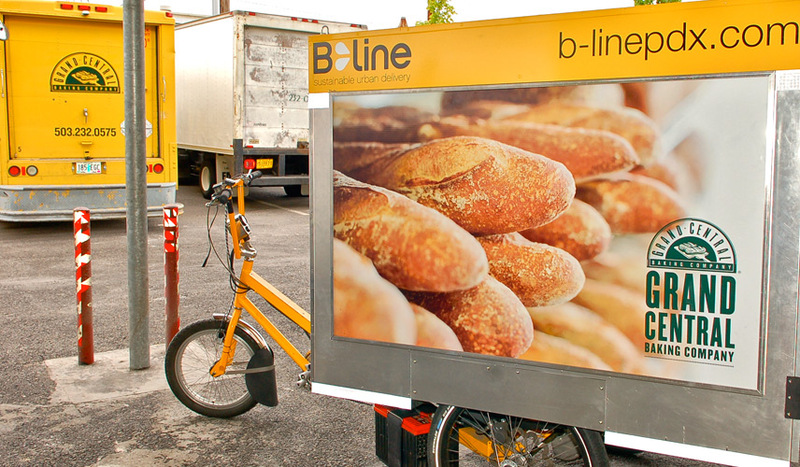 *Disclaimer--All bread in the trike is for delivery only. It may be possible in the future, but for now I recommend going to your closest Grand Central Bakery to purchase. 🙂 These two spots are easy bread-wise: Ciabatta loaves at Caffe Mingo and Yukon Gold Potato, Ciabatta, Baguettes and Como at Bar Mingo. The next stop is Papa Hadyn's off 23rd and Irving. Being a heavy foot traffic area, I am guaranteed to get a few comments from afar and even some folks who will ask about the trike and such as I'm packing up baguettes. Having to go through the kitchen can be a little rough since they're usually very busy. Somehow I make it through by yelling "behind you, behind you!" Just missing a hot plate here and a knife there. Now it's on to Blue Hour by way of Johnson St. to 13th, which for those of you who don't know, Johnson is a bike route downhill. Any street downhill is a nice break from pedaling. Blue Hour seems to have a thing for Como rolls because everyday they order about 150 to 200. Also, they are the only restaurant that gets three Shaq-size loaves of Ciabatta. I mean these things are huge! Little Bird Bistro is the next stop at 6th and Oak. This part of downtown is great for the fact that there are super wide sidewalks leaving room for pedestrians and trikes. No bikes though on the sidewalk. I believe that's the rule. Baguettes only at Little Bird. Really nice crew in the kitchen here. They always open the door for me and help put the bread away, which is nice because my caffeine from earlier is starts to wear off. Now on to the hotels for my next two stops. First, the Benson, where a few weeks ago Hollywood took over to shoot scenes for a TV show or movie. Not sure which. I tried to get in the action so B-line and GCB could get some more publicity, but apparently I have a face for radio. Come on now, they could have at least said that after I left. I bet if Portlandia was shooting there they would have made a trike skit on the fly. Now the fun part of my route, maneuvering up Broadway toward the Heathman Hotel, where taxi cabs decide to park in half the bike lane. Oh well, it's great advertising since its a busy area and I pass-by Pioneer Square. The Heathman usually gets the biggest order of Baguettes out of all the stops. They are super friendly here and love that their bread order is delivered via trike. Higgins Restaurant is that light at the end of the tunnel. Meaning my route is wrapping up. I've made it to the top of the hill at SW Jefferson St. and Broadway. An only once did I have to pedal that steep hill on a dead battery. That was definitely a workout I hope to not have to repeat. 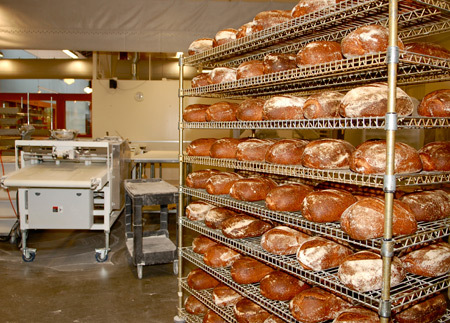 Higgins tends to get an assortment of Grand Central's best: Corn Levain, Baguettes, Peasant Levain, Sour Rye, Ciabatta and so forth. After that climb up SW Broadway there is a reward of a long downhill stretch of SW Columbia. The city was nice enough to time the lights so they turn green as you approach them. The tricky part here is staying safe and not building up speed to fast. Columbia dead ends at the SW Waterfront where Thirst Wine Bar and Bistro sits. This is another great area for advertisements because of all the foot traffic. I'll often take the hill down to Thirst nice and slow for two reason. One there are a lot of out-of-towners here who have never seen a trike and I'd hate to scare them and two so they get a good look at the ads. Two more stops on the east of side of the Willamette River and then my route is complete. Clarklewis on Water Ave and Beaker and Flask of SE Washington and Sandy Blvd. Both pretty straightforward drops in terms of bread. Conveniently the B-line warehouse is right around the corner. A couple facts about this route. It's about ten miles from start to finish. On the busiest day it takes less than two and half hours. If you see me on the road, don't hesitate to give a holler.